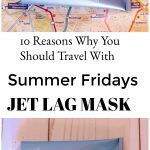 Do you ever take long flights, especially international flights? 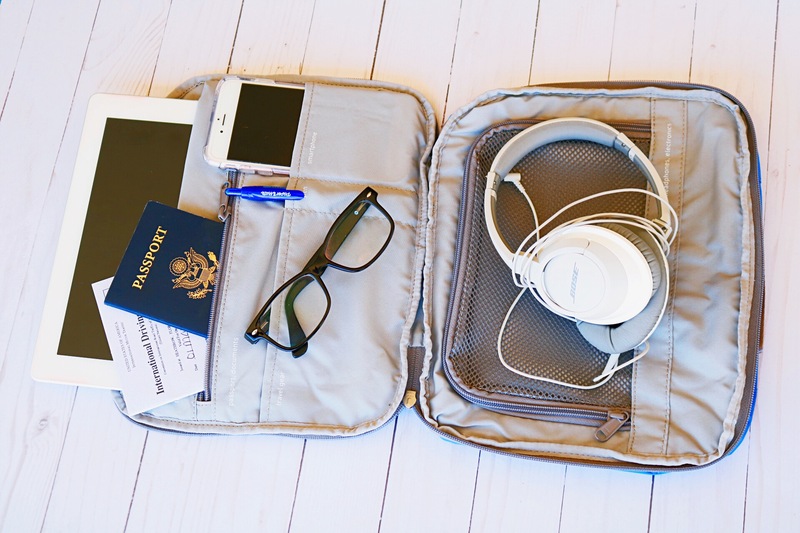 If you haven’t yet made your first international flight you may be unaware of all the items you need on hand during a long flight. Things that can easily disappear or get left behind. Thousands of ipads, laptops, cell phones, prescription glasses, wallets, headphones and other valuables get left on planes every month, winding up in the Bermuda Triangle of the airline lost and found department. Most of these items get left in the seatback pocket, but others slip to the floor and slide under seats. On an international flight you will need to have your passport out to fill in arrival and customs forms, you will need a pen, lip balm or chapstick, disinfectant wipes, baby wipes, Kleenex. Maybe you need eye drops, cough drops, a travel toothbrush, Advil – you get the picture. Many small, losable, moving parts. Typically you don’t want a bulky bag at your feet taking up valuable legroom, and if you do have a handbag or pack at your feet you won’t necessarily see if something falls out during your flight. Or worse, it can tip over and have everything fall out. This is where passengers utilize the germy, black hole that is the seat pocket. Pay attention for 5 minutes and you will never go near that beast again! (Just watch passengers and what they do with the seat pocket…) What do you think people do when they blow their nose on a plane, or cough up phlegm? Any repulsive, gross, germy detritus that humans want out of their hands gets put into the seat pocket. With that in mind I needed to find an effective way to keep all my inflight belongings organized and easily accessible. 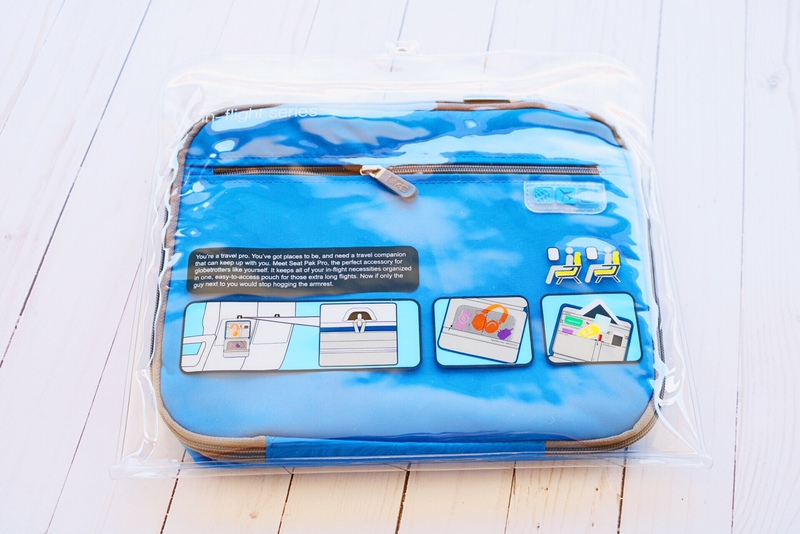 I get a lot of travel supplies at The Container Store, and while shopping there a few years back I got a really good bag that suspended from the tray table, giving me a place for all my belongings and circumventing my need to use the germ fest otherwise known as the seat pocket. 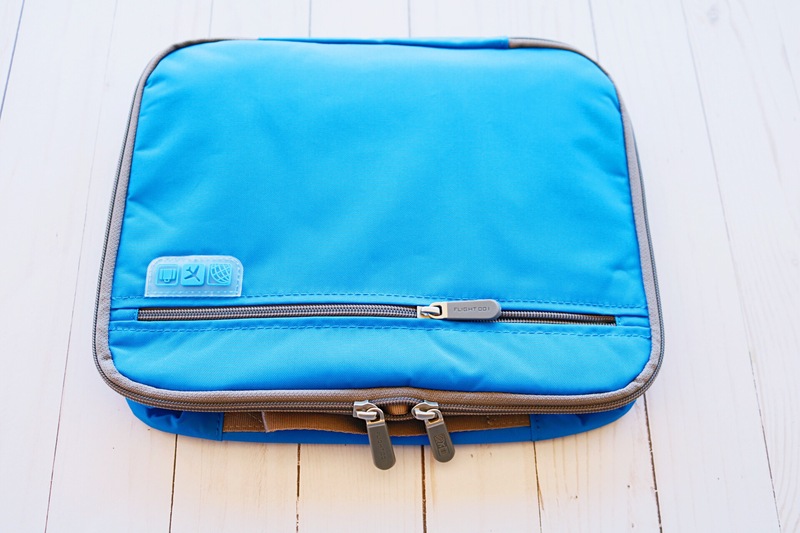 It was a really good device, but it was bulky, doubled as a shoulder bag (that I never used) and when I landed I found it quite cumbersome to try and put into my carryon or suitcase. I just bought this new Seat Pak Pro from The Container Store for my Summer 2018 travels. It works the same way as my old one, hanging from the tray table fastener, but is much less bulky. I’m taking this one with me on my summer 2018 Glam Italia Tours, and no doubt all the rest of my flights too. Here is what I like about it. It is slimline, so when I arrive at my destination I can either slip it into my suitcase or into my carry on bag, without dealing with the bulkiness I had with my old one. 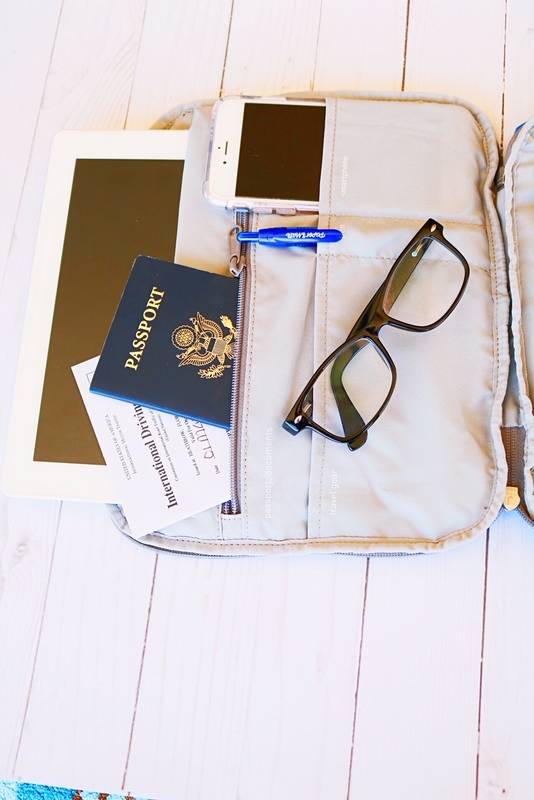 It has the right types of sections for the things you need, with a section for your pen, another for your smartphone, a large pocket for a tablet, sections for passport and documents, headphones and electronics, and 2 other random sections. The passport section zippers closed. Having your passport slip out of any bag would be a nightmare. With this bag you know exactly where it is, and it can’t fall out. The iPad section has a fastener, so my iPad won’t slip out or start slipping out while I’m trying to zip everything up and get off the plane. The fabric is lightweight but strong, and is easy to clean. It’s important to have a strong fabric that won’t tear and that you can clean easily if something gets spilled on it. It is really well constructed. This is super important! 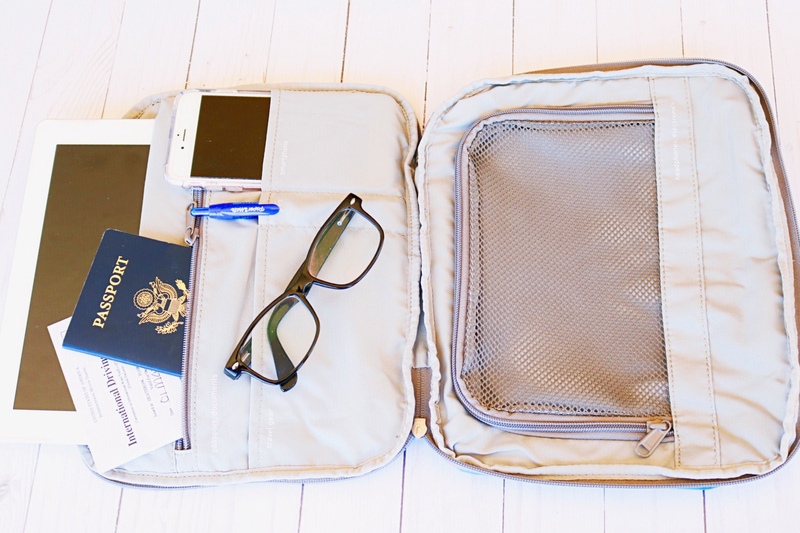 You need an inflight bag that won’t fall apart. I have seen some that are quite flimsy, and can tear easily or get holes in them. I’m a big believer that all of our travel gear should be well constructed and hold up to a beating.